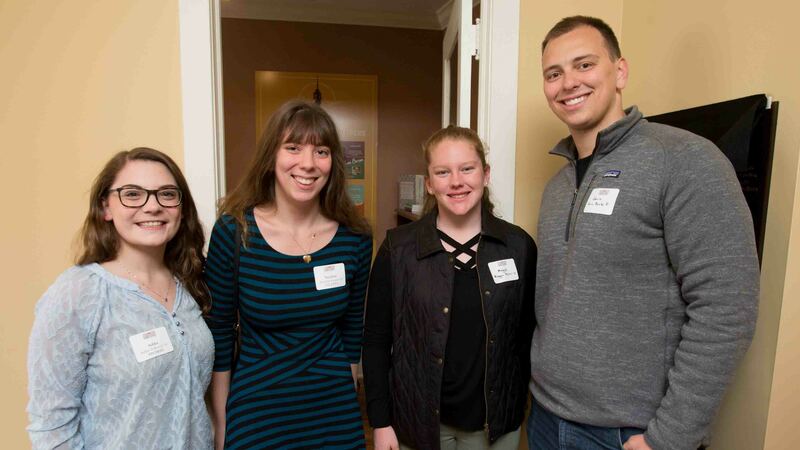 Emily Dentinger ’20 looked at the gathering across the newly refurbished hardwood floors in the front parlor of the big stone house on McCartney Street. Longtime faculty members, dignitaries, and even a representative of the German consulate looked back at her over glasses of wine. Central in no small measure because of this new house and what it represents. 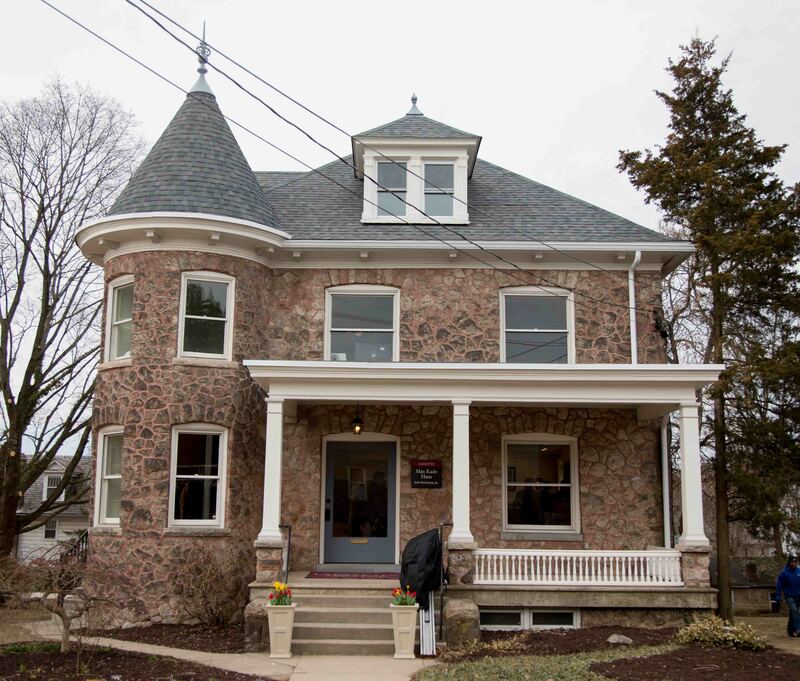 Dentinger, who majors in German and mechanical engineering and international studies, wasn’t only lauding the Max Kade Haus, a new extension at 606 McCartney for Lafayette’s Max Kade Center and German studies programs, which the party had gathered to dedicate. Dentinger said the Max Kade Foundation, the nonprofit that for 15 years has helped transform and deepen the College’s nearly two-century-old commitment to teaching German language and culture, is helping her chart her future. 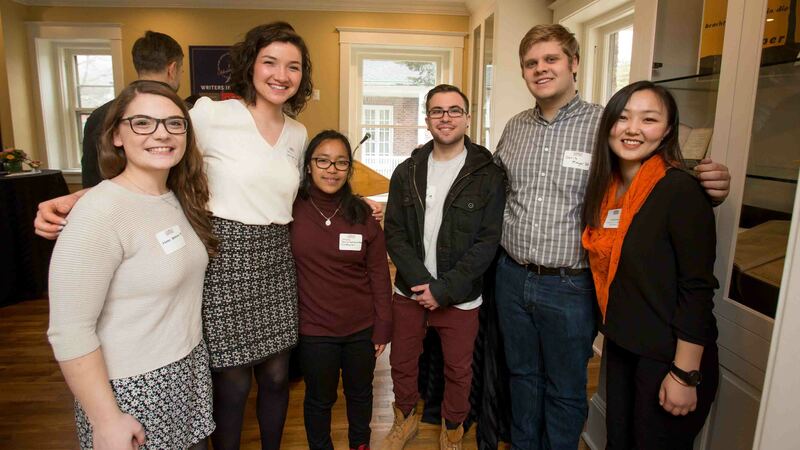 She praised the College’s work in conjunction with the foundation, which has brought dozens of writers, artists, and historians from fields ranging from creative writing to engineering to help broaden her worldviews. And perhaps because she personifies Lafayette’s role in the development of the center more than anyone else, Dentinger praised Margarete Lamb-Faffelberger, whose vision and work is not only helping deepen her understanding of world cultures, but has helped bring everything that the Max Kade Center has become at Lafayette into fruition—its facilities, its pedagogy, and its growing field of inspiration. The Max Kade Haus for German Studies and Visiting Scholars is being renovated with funding from the foundation. It’s the latest in a line of similar projects, beginning in 2003 with the transformation of a corner classroom on the fourth floor of Pardee Hall into the Lafayette headquarters of the Max Kade Center for German Studies. Since 2004, Lafayette and the center have hosted 13 visiting writers/artists, seven visiting professors, and six distinguished lecturers. These visitors often cross boundaries with other departments and disciplines from all over College Hill. History. Geology. Neuroscience. Creative Writing. Engineering. 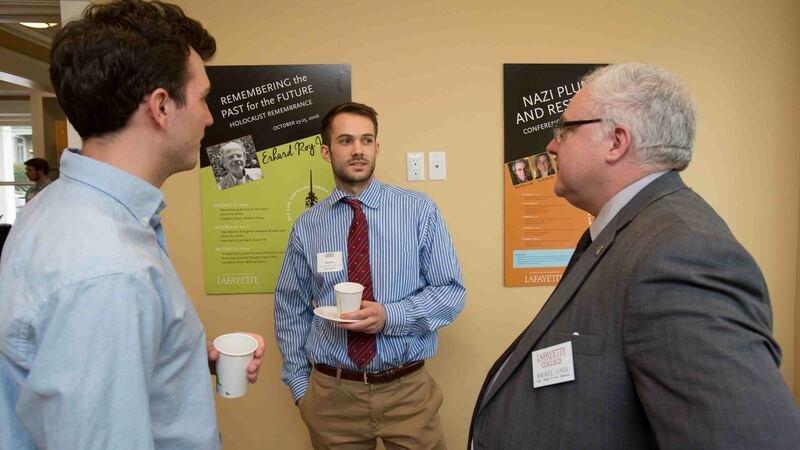 Building on the educational, scientific, and cultural programs and exchanges involving institutions and scholars with a German-culture focus, Lafayette’s Max Kade Haus augments and complements its Max Kade Center and further fosters broad interdisciplinary scholarship and dialogue. 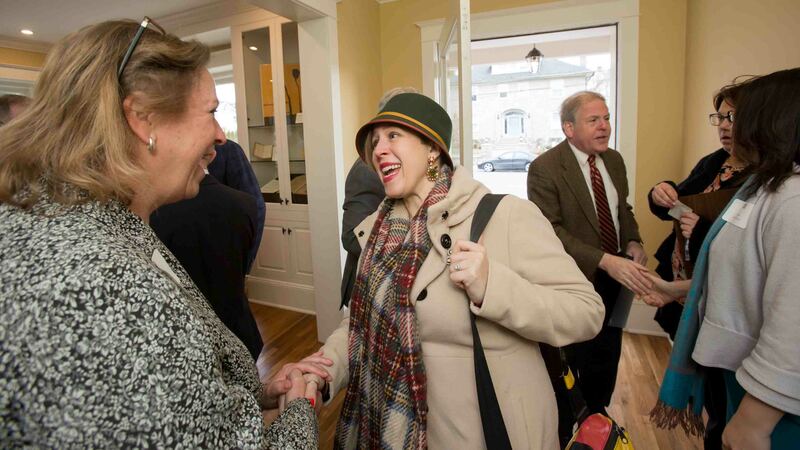 “We know that it is difficult for the German departments to set a foot and get something going like this,” Max Kade Foundation President Lya Pfeifer said in February on a visit to the building as crews completed the renovations. The organization helps dozens of other colleges and universities throughout the U.S., including six in Pennsylvania. “This is not easy since it is not the premier language taught on most campuses. So we work with the department if they’re having difficulties. They all have been successful. “I believe in Lafayette,” she added. It’s been Lamb-Faffelberger’s focus since moving to the U.S. from Austria decades ago. She received a Fulbright stipend to attend graduate school and realized how much she loved teaching the German language and culture to American students. She has seen the College’s German program grow and improve since she came aboard in 1992. The teaching of German language and culture was part of the College’s charter when it was founded in 1826. For decades, the Max Kade Foundation, named for a successful German businessman who immigrated to New York in the early years of the 20th century, has helped support German studies programs around the world. In 2003, Lafayette completed the work on the Max Kade Center, housed in a smart classroom renovated in part with money donated by the foundation. Lamb-Faffelberger launched the Max Kade Distinguished Lecturer Series, the Writer-in-Residence program, and the Professor-in-Residence program. Students work directly with the guests to enhance not only their understanding of the German language, but the culture of nations such as Germany and Austria. For example, students in the German 432 creative writing seminar worked directly this fall with Max Kade writer-in-residence Judith Nika Pfeifer to pen a German-language play about refugees around the world. “We are bucking the trend,” Lamb-Faffelberger says. In an era where other places of learning are cutting German programs, Lafayette’s is more robust than ever. The house was decorated with artwork, plaques, and displays celebrating German heritage. 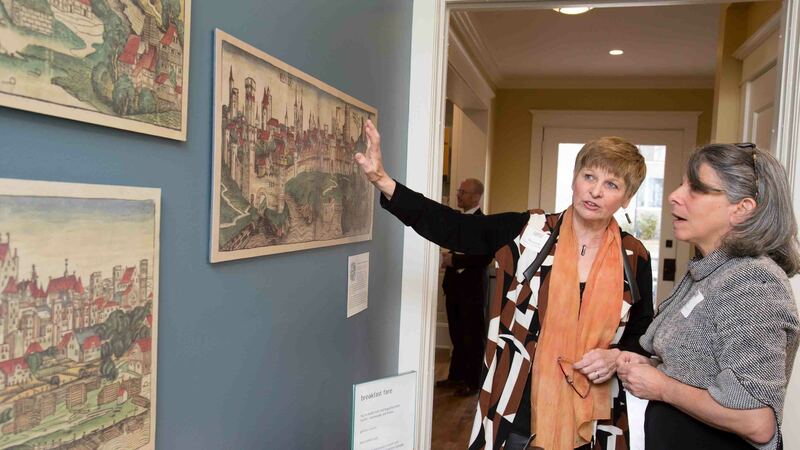 In addition to posters featuring every speaker, artist, and writer the Max Kade Center has hosted over the past decade and a half, there were cityscapes of Nuremberg, Cologne, Munich, and Vienna from the Nuremberg Chronicle printed in 1493. Lukenbach, A. A Collection of Hymns, for the Use of the Delaware Christian Indians, of the Missions of the United Brethren in North America. Bethlehem: J. and W. Held, 1847. Lukenback, A. Forty-Six Select Scripture Narratives from the Old Testament, Embellished with Engravings, for the Use of Indian Youth. Translated into Delaware Indian by A. Lukenbach. New York: Daniel Fanshaw, 1838. 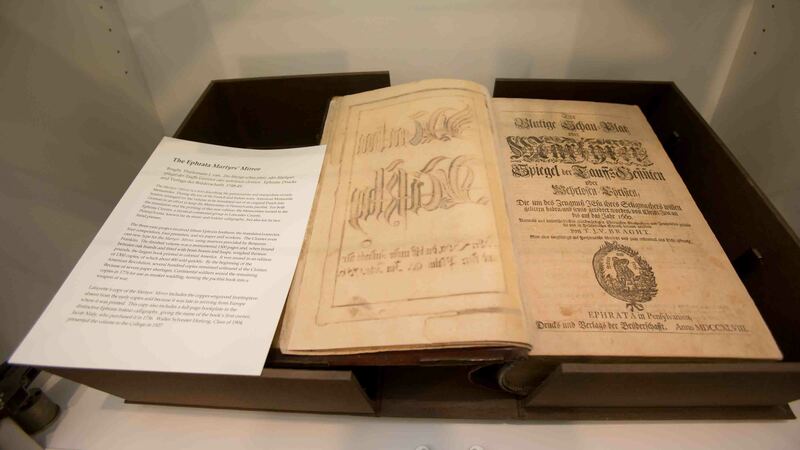 Alongside them was a colored leaf from the Nuremberg Chronicle; Martyrs Mirror, the largest book printed in colonial America, created in 1748 by the Ephrata Cloister Community, established in 1732 by Johann Conrad Beissel; a daguerreotype of John Peter Hecht (1840-1845), professor of German; and two prints by Bodo Korsig, the first Max Kade artist-in-residence (2004). Could you please provide information on upcoming “Corporate Kaffee” events? As a Lafayette alumnus and Director at the largest pharmaceutical company in Germany, I would be interested in attending. Thanks in advance for your response to my inquiry. We have a number of events coming up at the Max Kade Haus and on campus, and we’d love for you to join us. When you get a chance, please call me at 610-330-5381 or email me at wilfordm@lafayette.edu.